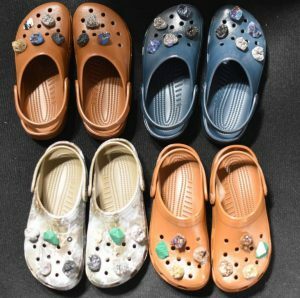 The Art of Reinvention – the return of the Croc! We have just seen the return of the Croc for adults at London Fashion Week, the classic all round footwear brand has taken on a stylish rebrand from uber cool UK designer Christopher Kane. This shoe has Never gone out of fashion for kids, it’s a summer staple but I have not seen any adults wearing them since Nicolle Appleton donned them many moons ago. Crocs have never been on trend for adults have they? The often derided and mocked synthetic moulded foam clog has a huge fan base of children and parents but it is almost Marmite like in its appreciation, you either love them or hate them. There is even a I Hate Crocs! Website. Like many mass-produced brands, they go in and out of fashion and maybe the time for Croc love has returned. Personally I love what Kane has done – transforming brand perception, creating a social media debate, its great PR for the good old much maligned Croc. We have often received briefs which challenge us to change a negative or perhaps tired brand perception and refresh it and with Christopher Kane’s Croc he has certainly achieved it. If you find out that it is an official collaboration i.e. Christopher Kane was paid does that take the gloss of? Well slightly, in an ideal world it would have been better for Christopher Kane to have been a Croc fan and have plucked them out of fashion obscurity rather than have been approached by a marketing bod. We also question the timing, isn’t a Croc a summer shoe? Somehow we cant imagine wearing them trotting along in the rain down the chilly autumn high street. But whatever the motivation or the timing, it has got us talking about them and reappraising the little old Croc. Now, the question is…will you be wearing them? @liathughesjoshi They could say that it's down to fathers nothing with their kids, poorer families, time stretched families - but no working mums - awful.